In the Chubu region that is located in the middle of Honshu of Japan, Hokuriku district is facing the Japan Sea. Fukui Prefecture is located in Hokuriku district. Ono City is located in the eastern part of Fukui Prefecture. 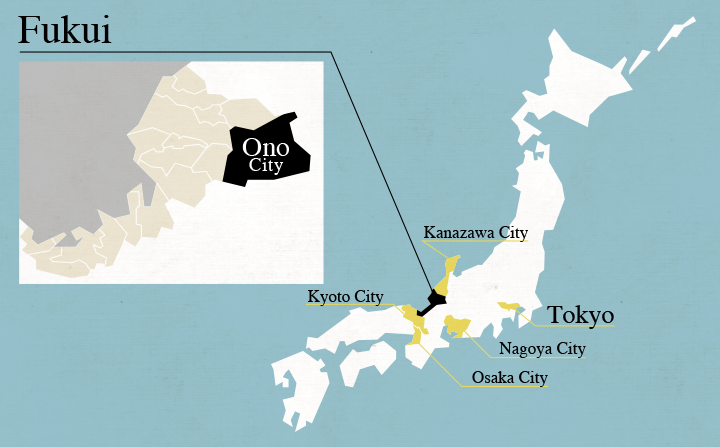 Ono City is the largest in terms of the area in Fukui Prefecture, occupying about one fifth of Fukui Prefecture. Tokyo is located west to the central part of Japan facing Tokyo Bay. Tokyo is the largest city on the Kanto Plain and one of the three largest cities in Japan. In order to visit Ono City from Tokyo, please see the access from Narita International Airport. "Osaka Prefecture is located in the center of the Kinki region. Osaka Prefecture is a representative prefecture in Japan next to Tokyo. Osaka City is an ordinance-designated city and one of the three largest cities in Japan. Osaka City is located almost in the middle of the Osaka Prefecture. In order to visit Ono City from Osaka City, please see the access from Kansai International Airport. Aichi Prefecture is located in the western part of the Chubu region facing the Pacific Ocean. Nagoya City is an ordinance-designated city and one of the three largest cities in Japan. Nagoya City is located in the western part of the Aichi Prefecture. In order to visit Ono City from Nagoya City, please see the access from Chubu International Airport. Kyoto Prefecture is located near the central part of Honshu. Kyoto Prefecture is located in the Kinki region facing the Sea of Japan. Kyoto City is an ordinance-oriented city, located in the southern part of the Kyoto Prefecture. Ishikawa Prefecture is in the central part of Honshu. Ishikawa Prefecture is located in the Hokuriku district. The prefectural capital is located in Kanazawa City. Ono Rokken → Entrance of Ono Castle (on foot)"
Ui Station → Entrance of Ono Castle (on foot)"